Do you need to see if an item is in stock at the store down the street? Instead of calling your local store, asking the clerk if a item is on the shelf and then waiting five minutes to hear it’s available, use Milo. Milo is a new web service that connects you with local retailers to give up to the minute inventory on the products you need. The term “brick and mortar” is often used to describe ordering your purchase online and then picking it up at a local store. 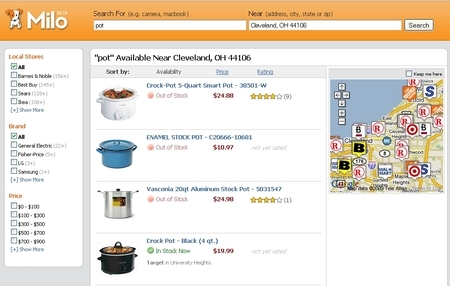 Milo fills this void by connecting many popular genres of products such as electronics, clothing, and cooking and bringing them together in once place so you can see if its in stock. In the insurance world, Insurance.com brings together many of the top auto insurance companies so you can choose and purchase the best policy for you. Milo does the same when it comes to consumer goods. After reviewing the website, everything that I looked at in my area didn’t seem to be in stock. However after looking at other states, I did see items were in stock. Thus, this indicates that Milo’s network is still growing and the accuracy depends on the location. Thanks again to Mike Kimmel for find.